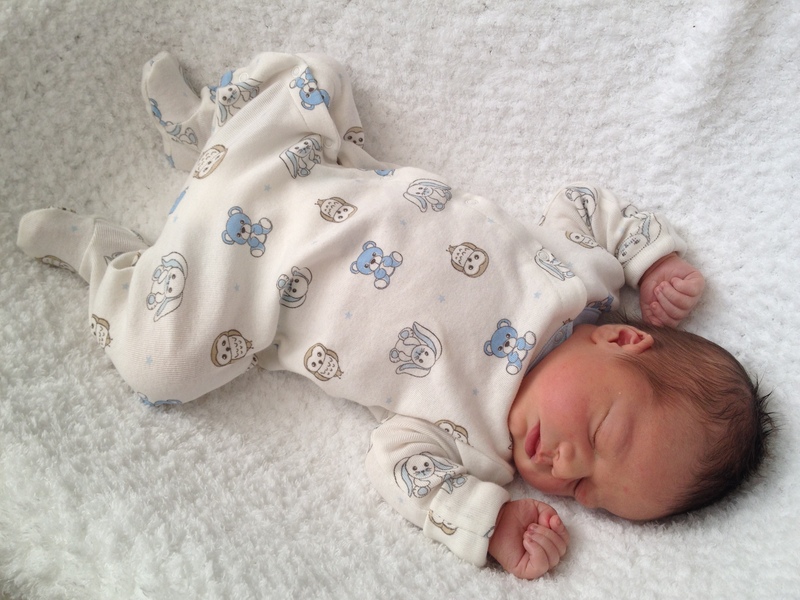 Our newest son was born at home at 11:02 pm on Sunday, August 31, 2014, weighing 8 lbs 8 oz. We are all, as always, madly in love with this beautiful little person. My sisters had arrived. Our van purchase had been finalized. The baby's due date had come and gone, as had the next few days, and still there was nothing more than the occasional contraction here and there. Which would have been fine, except that my sisters were, by unfortunate extenuating circumstances, leaving first thing Monday morning. I spent that week giving the baby the usual cajoling - spicy food, birthing brownies, long walks, and so on - but all it did was leave me with heartburn and sore hips. Twice I considered and then decided against a membrane sweep from my midwife, as nothing seemed to indicate that my body was on the verge of labour. Like his siblings before him, this baby was in no rush to leave his cozy womb. Sunday morning dawned somewhat more hopeful. The contractions were more frequent and of a different nature, crampy and lower like the ones that had preceded our daughter's birth. We went for a walk in hopes of helping things become more established, but by mid-afternoon it was all still rather flaky. Mild, irregular, nothing much to write home about. Still, it was something, so at 4:30, I made the decision to call the midwife and request a membrane sweep. The risks of the sweep seemed very minimal at this point; either it would tip the contractions into a more established zone, or it would all fizzle out again after some discomfort. The midwife came, swept, and went, and we soon settled in to Sunday dinner (lasagna - I was done with spice-induced heartburn at this point). The contractions did indeed gradually pick up. When labour seemed well established, with contractions coming strong and steady, the husband insisted that I call the midwife before we ended up with another unplanned unassisted birth. I agreed, and by the time she arrived at 8:30, I was feeling rather grateful that I hadn't waited any longer. My midwife immediately called for the second midwife and the waiting began, everyone certain it wouldn't be much longer now. Too many eyes on me? Too much pressure to hurry up and birth this baby before the girls had to leave? Just a simple matter of false labour thanks to the sweep done earlier that afternoon? A bit of a pause, or a full-out stop? The midwife, with my gratitude, had everyone leave the room for a while. A bit of space, some breathing room, time to collect our thoughts. The husband and I talked. One of my sisters came in to tell me that our mom had suggested we try to change the flights to the following day (we won't get into how the flights were supposed to be that day to begin with, but when I went to book them, she couldn't possibly take the day off work to drive to the city to pick the girls up on the Tuesday instead of Labour Day - those "unfortunate extenuating circumstances" I mentioned earlier). I decided it was worth a try, gave my beloved WestJet a phone call, explained the situation, and asked if we could switch to the exact same flight, just one day later. Well, we could, for $500. Unfortunately, $500 for the possibility that maybe-I-will/maybe-I-won't have the baby during that additional 24 hours really wasn't in our budget. Especially not with the new van sitting in our driveway, ready and waiting to seat our soon-to-be-four children. But she absolutely could not wave the difference in the (exact same, one day later) flight fees; disappointed, I chose to leave their flights as they were and hope for the best. I hung up the phone and the husband came back into the bedroom, asked what I wanted to do now. "I want to watch Doctor Who." What? We hadn't yet got around to watching the newest episode, and I needed a distraction. "...Okay! I'll be right back with the laptop." He's a good man, he knows when not to argue. I paced the room while we watched the Doctor enter the Dalek. The midwives sat talking quietly together outside the door. The girls corralled the children, who were quickly approaching the over-tired and over-excited stage. Everyone waited, but other than the occasional mild contraction, things were looking decidedly unhopeful. Halfway through the episode, the midwife came in to check on us. I was feeling more than a little discouraged by this point. The midwife gave us a few different options: she could send the second midwife home for some rest while staying herself for a while longer, we could try some different positions and movements to see if labour picks up again, we could try some other methods to encourage labour...or she could break my water and the baby would in all likelihood arrive very soon afterwards. It was 10:00 at that point and I wasn't feeling labour. My dilation had been at 4 cm when the midwife arrived to do the sweep, and a quick internal check confirmed no change. To me, the options were either go to bed or get this done with. Any other baby, I'd have gone to bed. But we had flown my sisters out here with the intent that they be at the birth, and it wasn't their fault that their return flight ended up having to be earlier than we had initially planned. It meant a lot to them - and to me - that they be there for the delivery. We discussed the various risks and possible outcomes of breaking my water. There were no guarantees. But I was six days past my EDD, I had been in active labour, and my midwife expected that in all likelihood, breaking my water would result in the baby arriving within the next hour or so. The husband and I discussed it some more. It was so far outside my typical view of birth to consider breaking my water for no purpose other than to hurry things along, and I was having a hard time with the idea. Even the sweep had been beyond my comfort zone; I prefer to leave baby alone, let him or her arrive when they're ready, medical reasons aside. I confessed my anger that by having my sisters come, I had also given my mother this small measure of inclusion in and influence over my labour. 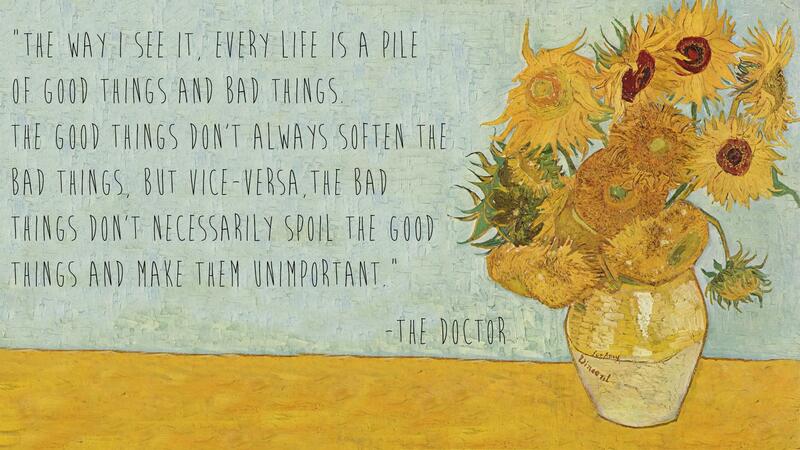 "But it's like that Doctor Who quote you love: Just because there's some bad, the good things don't become less important. You've enjoyed having your sisters here. You want them here for the delivery. This isn't her choice, it's yours. I feel comfortable with either option. Do what feels right to you." Oh. That man. I wiped away a few tears, took a few deep breaths, and told the midwife I wanted to have my water broken. At 10:18, the midwife broke my water, reminding me as she did so that a warm shower would help ease the transition. I shut the laptop at the foot of the bed before she began; I couldn't have my water broken while a Dalek had such a direct view of the proceedings. The experience was uncomfortable, to put it mildly, and I was grateful to step into the hot shower as soon as it was done. The contractions picked up immediately. They were indeed more intense, but the water was lovely on my back. Each contraction was preceded by a gush of water; I'd lean into it, knees bent, moaning low while reminding myself to keep breathing, keep breathing. Then it would ease and I'd rock and sway through the interim cramps, talking with whoever was at the door at the time - sometimes a sister, one of the kids, the midwife, or most often the husband. The husband kept asking if he could get me anything. Finally, feeling amusingly annoyed by the question, I asked for a TARDIS so I could pop a few minutes into the future when this would all be over. He explained why that wouldn't work (nerd), so I suggested an epidural instead. He winced at the thought of a needle, and I agreed - even then, the idea of having a needle inserted into my spine sounded like someone's idea of a sick joke. We chuckled about that until the next gush of water indicated the arrival of another contraction. The intensity continued to build and I knew it was almost time. After one contraction nearly brought me (literally) to my knees, I told the husband to turn off the water and call the kids in while I knelt on the shower floor. The midwife slid a towel and blanket under me, the next contraction hit, and I hollered low through the push. I reached down to control the speed of arrival as the head emerged, followed, as always, by that blissful sense of the worst of it being over. After a very brief pause, the next contraction delivered the rest of the baby, which I guided forward and lowered onto the waiting blanket. It was the first time I had caught my own baby. The baby let out a cry, then relaxed into the blanket. It had been 45 minutes since my water had been broken, and everything had gone as perfectly as it could possibly go. The next 15 minutes are a blur of congratulations, discomfort, joy, and that lovely moment of "Well, what is it?" "It's a boy!" Our two costume-loving middle children had attended the birth dressed as a knight and a dragon, and everyone else had been there to witness the moment as well. After the placenta arrived, the oldest boy cut the cord, grinning the whole time. The midwife passed the baby to his Daddy while I took a short but glorious shower. Clean, I slid gratefully into bed and watched as everyone said hello to this new little person. Our sweet youngest son is four days old now. He's healthy and snuggly and nurses well and what more is there to say? We are so grateful for his presence in our home and our family. Congratulations on your newest .addition! He is so sweet! Each of their births were so unique; I love looking back on them. Best wishes to you! So happy for you. He is just beautiful! You always have such a positive way of looking at things, Michelle; thank you! I am so very happy for you. My how I miss reading you. When I have time I come here and I catch up and what a beautiful catch up it is. You have welcomed your 4th beautiful child into your family and you amaze me at your strength.